ULAAN BAATAR, MONGOLIA-MARCH 11 : Mongolian street kids wait in line to get registered at the child detention center March 11, 2010 in Ulaan Baatar, Mongolia. 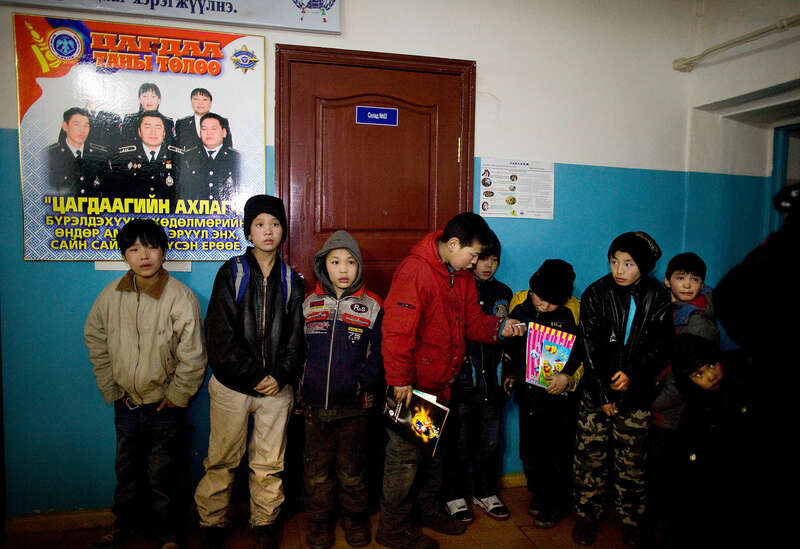 The police picked up a dozen boys to get them off the streets in the cold weather housing them at the Ulaan Bataar Child Welfare/ detention center sponsored by World Vision. There about 45 kids live in the dormitory where they get hot food, showers, and some educational activities until their parents claim them. Before the children can go into more permanent shelters they are kept in the welfare center for up to 6 months. After that the state labels them as being abandoned or orphaned. Mongolia suffers with a very high number of alcoholics, all consuming cheap Mongolian vodka that is readily available to the poor and the unemployed, Many Mongolians have immigrated to the capitol city from the far away provinces seeking employment, living in rented traditional circular felt yurts with no running water or electricity. The problem is severe causing the number of street children to rise, fleeing their abusive, dysfunctional homes. Some children are regularly beaten at home, and for the impoverished it is common to send the child out to make money. During the winter this means extreme hardship, the children out on the city streets are dealing with temperatures dropping as low as -25C mid- Winter. This year Mongolia has experienced the worst winter in 30 years. Presently the government has declared an emergency requiring foreign aid to alleviate the impact of the " Zud" ( Mongolian term for a multiple natural disaster) caused by bitter cold and thick snow that has effected 68% of the provinces.